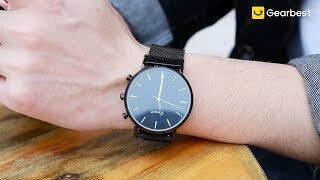 From Gocomma comes the interesting KW16, a hybrid smartwatch that in addition to the design also boasts an almost unmatched range and a particularly low price, about $18.99 for a concentration of style and technology from the excellent value for money. As mentioned, this is a hybrid smartwatch, that is, the category of timepieces that try to favour style and design by integrating a series of technological functions, without, however, giving way to excessively “GEEK” looks and functions. 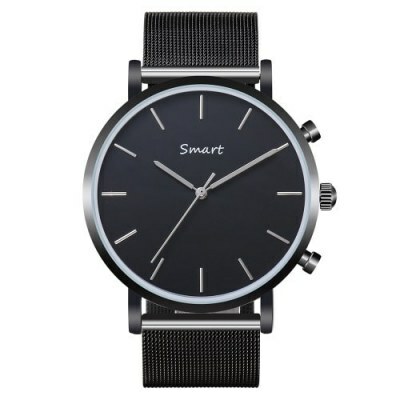 Here, then, is a stainless steel case, a stainless steel mesh strap and a classic style, for a clean dial, in the two versions black and white, with minimalist timepieces and hands. At first glance it looks like a classic watch, but it hides a technological heart that interfaces with iOS and Android through Bluetooth and the dedicated application. Other features of Gocomma KW16 include notifications (QQ, WeChat, Twitter, Facebook, Whatsapp, Skype), the inevitable step counter, sleep tracking, alarm, call and SMS notifications, and the ability to activate the camera remotely, shaking the wrist. IP67 certified with resistance to diving, another noteworthy feature is the autonomy: in standby the device is able to last up to 22 months, which are reduced to 13 with more intensive use. Finally, it also has a “rescue” mode that can be activated by pressing a button, which in the event of help will send a message to three different people.